Jane Fonda, still rockin' the evening pantsuit/gown thing. Photo by Kayla Rocca. Tina Fey, being dragged backwards by an invisible hand yanking at her hair. Photo by Kayla Rocca. We don't have a joke here, we just like Connie Britton. IS THAT SO WRONG? Photo by Kayla Rocca. "You want to interview me when Tina Fey and Jane Fonda are here?" - Kathryn Hahn commits the mistake of informing the media that Tina Fey and Jane Fonda are here. Photo by Kayla Rocca. "Since I learned about phones yesterday, I have since decided to learn everything there is to know about phones. So let me see this one...yes, yes. This is a pattern-phone. You can tell by the pattern on the back." Photo by Kayla Rocca. <em>Samba</em> star Omar Sy is really, really, <em>really</em> tall. Photo by Kayla Rocca. "Just another hour or two and then we can go home and read some Proust." — what Chloë Grace Moretz is thinking, probably. Photo by Kayla Rocca. Antoine Fuqua mentally criticizes the lighting choices of the paparazzi. Photo by Kayla Rocca. From left to right: John Cusack, who is playing "old Brian Wilson" in <em>Love & Mercy</em>; some dude who is probably not thematically relevant to this photo, we're sure about that; and Paul Dano, playing "young Brian Wilson" in <em>Love & Mercy</em>. Photo by Giordano Ciampini. They tried to co-ordinate their hair product usage. Photo by Giordano Ciampini. John Cusack, immediately before exploding into smoke. Photo by Giordano Ciampini. Liv Ullman and Jessica Chastain here represent two generations of total badasses. Photo by Giordano Ciampini. Ben Vereen is so cool when his tailor said "I gotta put a hemline on this jacket" Ben Vereen just said "Brother, <em>let it ride</em>." Photo by Giordano Ciampini. Richard Gere waves his withered, palsy limbs at ladies who remember seeing <em>An Officer And A Gentleman</em> in the theatres. They are thrilled. Photo by Giordano Ciampini. Jena Malone feeds off the life energy of the elderly, like a space vampire. Photo by Giordano Ciampini. "My <em>man</em>." Photo by Kayla Rocca. We don't want to go all GoFugYourself, but did Elizabeth Banks make this outfit out of spare curtains or what? Photo by Giordano Ciampini. Rosamund Pike, daring the photographer to a fist fight. Photo by Giordano Ciampini. Rosamund Pike and Simon Pegg, daring the photographers to a <em>double</em> fistfight. Photo by GIordano Ciampini. 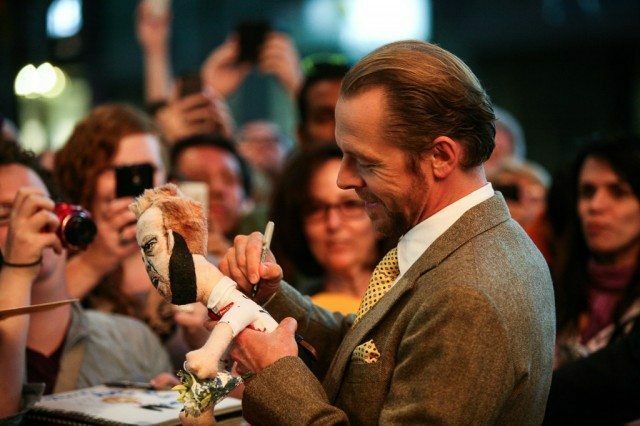 "Signing a little dolly of myself. Right. Not surreal at all." Photo by Giordano Ciampini. Christopher Plummer, doing whatever the hell he wants. Photo by Giordano Ciampini. OH GOD THEY'RE LOOKING RIGHT AT US RUN. Photo by Giordano Ciampini. Reese Witherspoon, asked a question about potentially aging out of the infamous Hollywood preference for younger actresses, focuses her eyes on the questioner and dissolves him instantly. She is satisfied. Photo by Giordano Ciampini. With the biggest-ticket “prestige” films having already premiered, Sunday marked the annual shift of the Toronto International Film Festival from Important Films to that which composes the majority of its slate: “smart” but undeniably commercial fare (like Simon Pegg’s Hector and the Search for Happiness, The Equalizer with Denzel Washington, and This Is Where I Leave You, starring Tina Fey and Jason Bateman), prestige product films that don’t have quite the same star power as the big guns (Miss Julie with Jessica Chastain, Richard Gere’s Time Out of Mind, or Love & Mercy with John Cusack), and non-English films that have already been successful or that foreign studios think will be hugely successful (Samba, a French film premiering at TIFF, is a good example). Naturally, not all of these films will be good simply because they’re at a film festival, but on Sunday, TIFF’s yearly conversation about film shifts from looking and gawking to actually watching. Which didn’t stop us from looking and gawking, of course. Want more TIFF coverage? Torontoist‘s film festival hub is right over here.